Why should we care about the War of 1812? Now the U.S. Civil War, that’s something else. We are in the midst of celebrating the 150th Anniversary of that great and horrible war. There are many reasons why that war was of immense importance to our nation and locality, and thousands of books have been written about it. Comparatively little research and writing has been done about the War of 1812. But it was of great importance to our nation, state, and locality. The War of 1812 began after diplomacy failed to solve the problem of Great Britain interfering with American shipping, as the U.S. struggled to stay neutral while France (under Napoleon) and Great Britain were at war. America felt Great Britain had failed to respect her independence, and was also interfering with her westward expansion into the Ohio Valley. 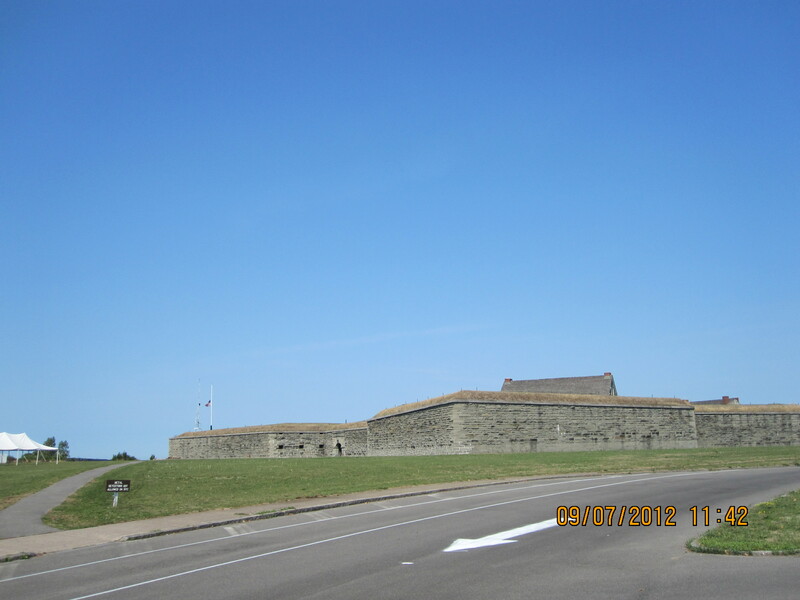 I was shocked to learn that the British continued to occupy Fort Ontario, at Oswego, New York, until 1794! The borders of New York State with Canada were the major battlegrounds of the war. The initial American goal was to invade and conquer Canada. This obviously failed, or U.S. borders would be quite different! 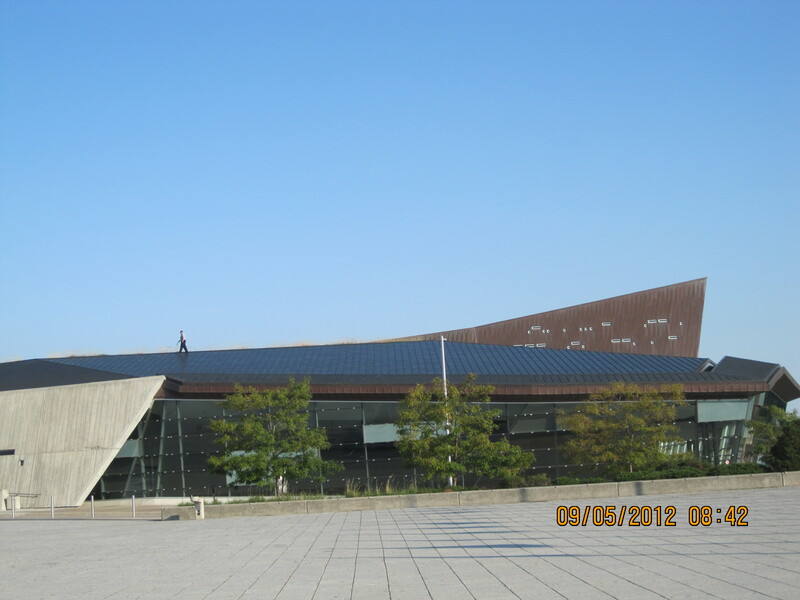 There were land and naval campaigns on both Lakes Ontario and Champlain. Nationally, our success- or at least our non-failure- in the war cemented the United States as a real nation, and real world power, which would survive a rocky start. The war also produced one of our national symbols, Uncle Sam. Samuel Wilson was a Troy meatpacker who provided supplies to the large military base or cantonment in East Greenbush. The well-documented story goes that the initials U.S., stamped on his barrels of meat, came to stand for his nickname, Uncle Sam. 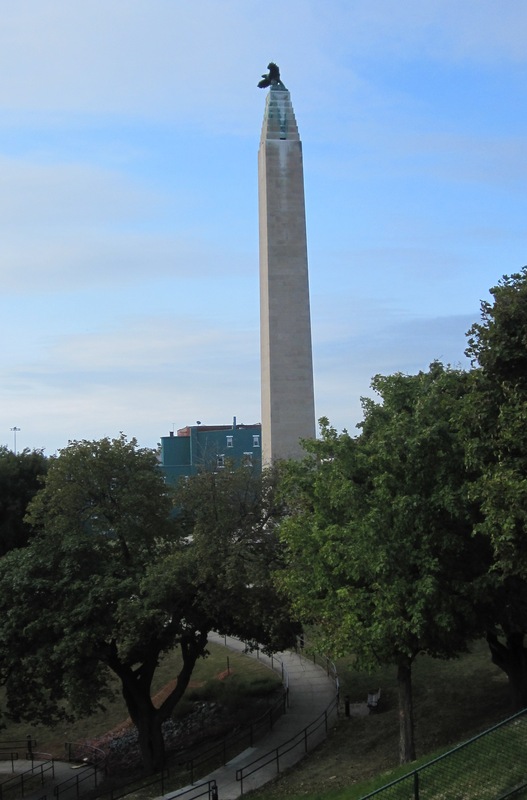 There is an Uncle Sam Trail, which will take you to sites in Troy connected with his life and death. He is buried in Oakwood Cemetery. Check out the website http://www.unclesamtroy.org for lots more information. The East Greenbush Cantonment was the headquarters of the Army of the North. As many as 5000 soldiers were quartered throughout the war in about 20 buildings in the area of what is now known as Hampton Manor. One large barracks building survives to this day. I find it amazing that the “Troy Post” newspaper of the time records events of the War of 1812 in great detail, but never discusses the presence of 5000 soldiers. Just last week an excellent exhibit about Rensselaer County and the War of 1812 opened at the Rensselaer County Historical Society in Troy, New York. It is open Thursday-Saturday from noon to five. It includes a wonderful scale model of the cantonment. The society also has a permanent exhibit about Uncle Sam. Samuel Wilson is buried in Oakwood Cemetery in Troy. 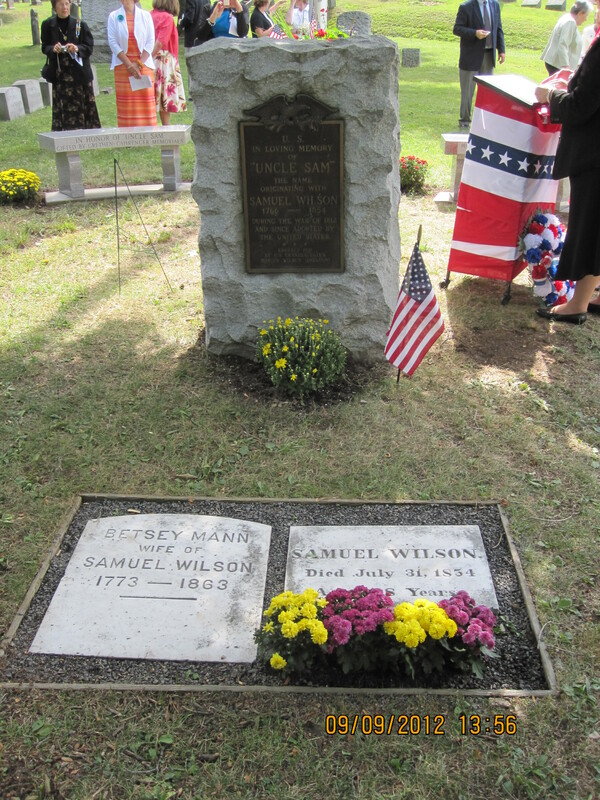 In September, the President General and New York State Regent of the Daughters of the American Revolution installed new benches at and new signage leading to “Uncle Sam’s” grave. Of course, I am interested in Schaghticoke’s part in the war. Unfortunately, at this point there is not much information on Schaghticoke men in the war. The pension papers of Revolutionary War veterans are all online, but those of the War of 1812 vets are not, though that accomplishment is a goal of the National Archives. There is some information on local men and events. One of the biggest effects of the War on Schaghticoke was the founding of the Powder Mill by the Masters brothers on the Tomhannock Creek. That industry was begun in 1812 to produce black powder for use by the U.S. military in the war. The Schaghticoke Powder Company was in business in Schaghticoke and Pittstown until 1928, making a strong contribution to the local economy. 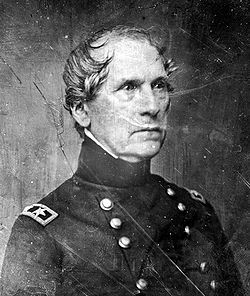 One of the most famous people ever to live in Schaghticoke, John Ellis Wool, began his military career in the War of 1812. He was raised by his grandfather, who had a farm on what is now Wetsel Road, off Fogarty Road in the southern part of the town. He had experience in a Troy militia unit before the war, so that when he enlisted in the regular Army, it was as a Captain. After the battle of Queenston, Ontario in 1813, he was promoted to Major for his heroism. After the battle of Plattsburgh in 1814, he was promoted to Colonel, and by the end of the war he was Inspector General of the whole U.S. Army. He went on to be a General in the Mexican and Civil Wars and was proposed as a Presidential candidate. The Rensselaer County Historical Society in Troy has quite a few of the possessions of Wool, including his uniform coatee from the War of 1812. This extremely rare coatee is currently on loan to the Canadian War Museum as part of an exhibit in celebrating the bicentennial of the war. One of the glorious memorial swords he received for his military valor is part of the exhibit at the Historical Society. Jonathan Read was in an artillery company of militia from Pittstown, which may have included Schaghticoke residents. Shortly after the war began in 1812, Read’s artillery unit was called to service for three months, as a part of 13,500 militia men mobilized by Governor Tompkins in New York State. Read left a journal of his service, a Xerox of which is in the Rensselaer County Historical Society. Unfortunately he only gives names of others in his company as appropriate- for example, if a man became ill, or was court martialled. So we don’t know many of the men who were with him. His commander was Captain, later Major, Andrew Brown. The Company left Pittstown on September 15, 1812, met up with another company in Waterford, and walked to Sackets Harbor, on Lake Ontario just west of Watertown. Achieving from 12 to 18 miles a day, they arrived in Sackets Harbor on Sunday, October 4. The company finished its three months of duty on December 18. Read stayed a few more days, leaving with a few others on December 23rd. They traveled by sleigh, making about 25 miles a day, arriving in Lansingburgh on December 29th. Read walked home to Pittstown the next day. While Read’s militia company did see a bit of action, sparring with the British on the opposite shore several times, there was no major battle during his service. The main battle of Sackets Harbor took place on May 29, 1813. Read recorded just one fatality in the company, a man who died of disease. Indeed, he seemed to have enjoyed his deployment. He recorded generous hospitality in the inns they stayed near both going and returning, and made no mention of any hardships or deprivations. He often described the countryside they passed through, noting soil type and vegetation. Surprisingly, he recorded seeing two deer on the trip home, the first he had ever seen. He also ate venison for the first time on that journey. He summarized that he had been away from home for three months and twelve days and traveled 475 miles. Google Maps gives the distance as about 420 miles- so his estimate was quite accurate. There is a New York State Historical site in Sackets Harbor, on the site of the battle. During the summer, the commandant’s house and other exhibits are open. There will be a bicentennial celebration on May 29, 2013. http://nysparks.com/historic-sites/7/details.aspx. 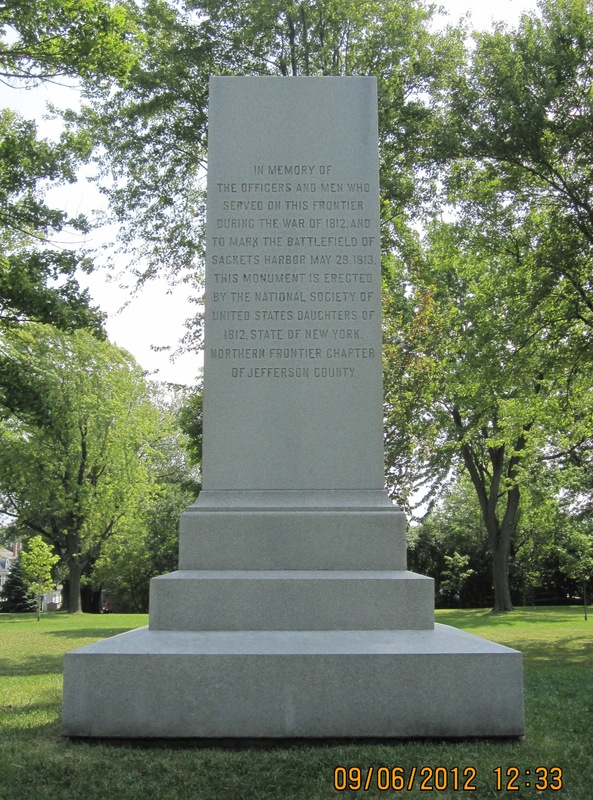 monument at Sackets Harbor marking the centennial of the British attack, 1913. According to Sylvester’s “History of Rensselaer County”, William Knickerbacker, resident of the Mansion at the time, was Colonel of a local militia regiment during the War of 1812. He states, “Many from this town either participated in the war or were in the “Eddy expedition” so called, that marched north at the time of Plattsburgh, but was not in time to join that fight and returned home in a few days.” Thanks to Ronald Bachman and his book about Michael Vandercook of Pittstown, “A Fine Commanding Presence”, we know more about the Eddy expedition and the local militia in the war in general. Michael Vandercook, born in 1774, had been in the militia for many years. He was appointed Brigade Major and Inspector of the Third Brigade when Governor Tompkins called up the militia and divided it into eight brigades at the start of the war. In June of 1812, Vandercook was ordered to go to Plattsburgh, along with militia men- this probably included local people. 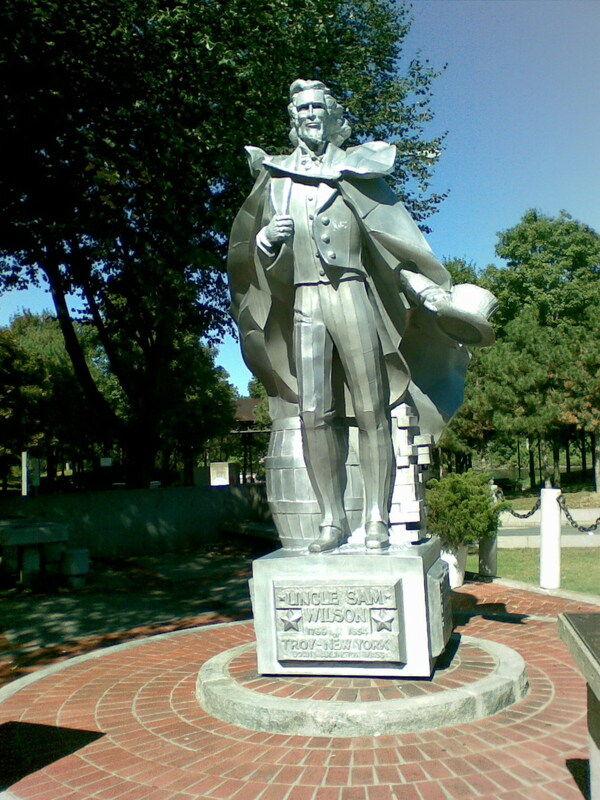 General Henry Dearborn was supposed to be executing an invasion of Canada and the capture of Montreal. After much delay, Dearborn acted in November. The militia men were virtually unequipped for battle and many refused to cross the border into Canada. The invasion failed. Vandercook and the militia were discharged from duty in time to be home by Christmas. But on to “the Eddy expedition”. In the summer of 1814, the British attempted to invade New York State via Lake Champlain. The militia were called out again, and Michael Vandercook’s service record notes that the 8th Brigade, led by General Gilbert Eddy, was “mustered at Troy & Schaghticoke” on the 8th, the muster completed on the 13th. They headed north for Plattsburgh on September 13, and reached Granville by September 16. At that point they received word that the British had been defeated in the Battle of Lake Champlain on September 11 and were discharged to go home. At least two other local men in the Knickerbocker Regiment, the 45th NYS Militia, were Isaac Tallmadge, who was a lieutenant, and Alexander Bryan, who was a captain. It seems that the impact of the War of 1812 on Schaghticoke and Pittstown was relatively minimal. Matters could have been quite different if the Canadian invasion of New York had succeeded! It did result in one new and important industry- the Powder Mill. Perhaps local farmers helped supply the large Cantonment at East Greenbush. And some local militia men got to travel away from home for the first time.